Home / Editor's Choice, Entertainment News, Featured Articles, Gossip and Drama, Politics / Some men will never see heaven, NATASHA reveals the most painful thing a man has ever done to her in a relationship, this is EVIL!!!! 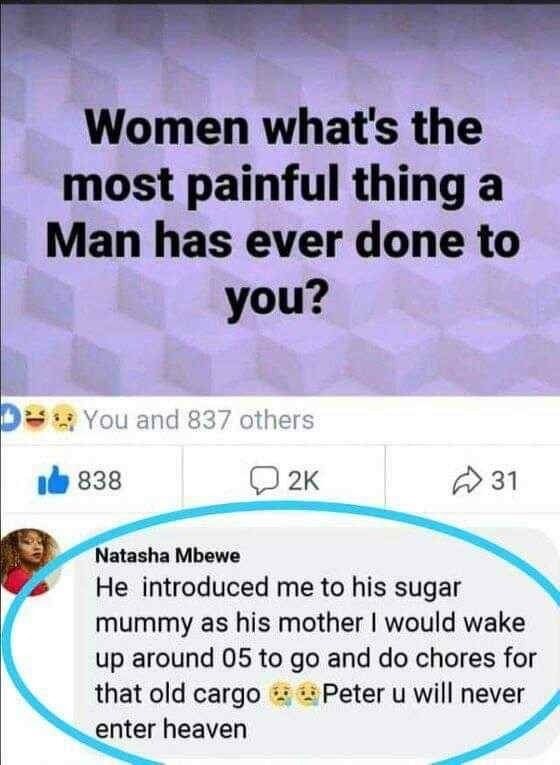 Some men will never see heaven, NATASHA reveals the most painful thing a man has ever done to her in a relationship, this is EVIL!!!! Wednesday, February 13, 2019 - This lady has revealed the most painful thing that a man has ever done to her when she was in a relationship and it will take decades for her to forget. Natasha was dating a guy called Peter who introduced his sugar-mummy to her as his own mother. She would wake up at 5AM to do household chores for Peter’s sugar-mummy, thinking that she was portraying wife material behaviours to the woman she thought was Peter’s biological mother. When she came to find out that Peter had introduced his sugar-mummy to her as his own mother, it was too late. Some men are just evil.